Make paddle boarding just one of many great experiences while visiting the beautiful Cape Breton Island, Nova Scotia! Be sure to check out what else there is to offer in the Cheticamp/Margaree area, plan to stay for a few days (you'll be sorry if ya don't). Here is a list of local attractions, activities, businesses, eateries, and drinkeries. "Expert or beginner, I will provide a great day fishing." Jimmie is an enthusiastic and wise salmon fishing guide, who caters to both the Margaree and Cheticamp rivers. Regardless of your experience as an angler, you'll be sure to learn something from this dude, while you enjoy your time on these world class river systems. Follow him @agreatdayfishing and see for yourself! Are a nature loving couple living in Cheticamp, Cape Breton, always exploring new adventures. They have a strong connection to the outdoors and living a healthy lifestyle and we created this blog to share our passions with like minded people. Bicycle shop situated in Cheticamp on the Cabot Trail. Sales, rentals, repairs, apparel, parts and accessories, cycling tours, training camps, baggage shuttling & more. Le Portage Golf Club in the Acadian village of Chéticamp, welcomes you to enjoy a round of golf on our wonderful course filled with breathtaking views of the Chéticamp Highlands. "Our 18 hole 6,777 yard par 72 layout is sure to challenge golfers of all abilities which includes four sets of tees for golfers of all levels, Challenging tee shots resulting from tree lined fairways on every hole are sure to keep you focused during your round. Along with great views of the Highlands, you will no doubt be taken away by the beauty of the layout, the land, and the hospitality you will receive here at Le Portage Golf Club." Whether you're on the move to your next adventure, or just looking to chill in a friendly and vibrant environment, the Frog Pond Cafe and Sunset Art Gallery is a must do! With a variety of fair trade specialty coffees and teas, and top notch locally made pastries, they offer a treat that is tough to beat. 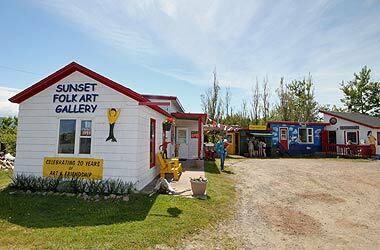 The cafe is attached to the Sunset Art Gallery, which is home to many beautiful and funky creations made by talented local artisits. It is an eclectic hub where you'll meet both travelers from all over, interesting locals, and there is a chance that you'll catch some live music. Great people, great vibes, check'em out! After a busy (or lazy) day of taking in your beautiful surroundings, be sure to stop by Le Gabriel to enjoy some local food and music. "The Gab" houses both a dining room restaurant, and a live music/sports lounge which features nightly high end musical talent from 7pm-9pm. The lounge also has free-play billiard tables. Come grab a drink, catch some tunes, shoot some pool, and mingle with locals and fellow travelers. "A great Valley to Sea" indeed. The River is world renowned, the Harbour and its coastline are home to some beautiful and tranquil beaches, and its People are warm, welcoming and eclectic. The Salmon Pool Inn, located on the beautiful Margaree River and Cabot Trail, has a menu that builds from our local food sources. Seasonal and inventive Chef Kirsten Cable presents a weekly selection of what is coming up in the Margarees. Complemented by craft beers and wines from Nova Scotia. Local pub atmosphere with fine dining. Captain Mark's Whale and Seal Cruise in Pleasant Bay, Nova Scotia, Canada offers some of the best whale watching on the Cabot Trail! Enjoy a beautiful day out on the water off the coast of scenic Pleasant Bay, as you observe these magnificent sea mammals frolicking in their natural habitat. No matter if you are an experienced horse rider or an absolute newbie, you will love our Horse Riding Trails. Erin Gillis will guide you through the most unforgettable scenery in Cape Breton Island, Nova Scotia. Discover Horseback Riding Fun for the whole family! Cape Breton Highlands National Park is an incredible natural region, with unique cultural attributes.